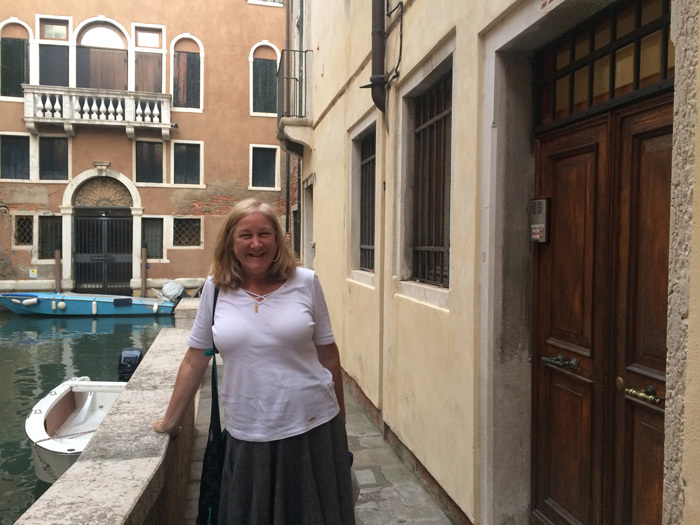 Today is the day my friend Annaline and I leave fabled Cinque Terre for storybook Venice. From one romantic area of Italy to another. I have been traveling with my Annaline, since hitting mainland Italy after Sicily. (We met at a hostel by the Amalfi Coast.) 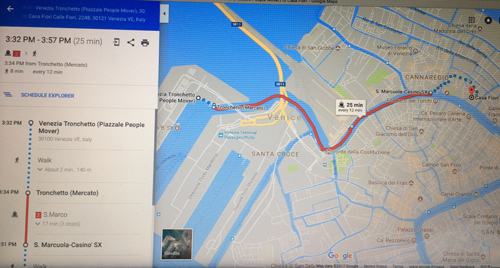 We’re traveling on FlixBus., but to get to our bus, we need to leave Riomaggiore (our Cinque Terre home base) and get to La Spezia as that’s where FlixBus travels from. I set my alarm for 8am and had gone to sleep at about 1:10am. Not enough sleep. Very fast shower. We took our bags down the many flights of stairs. Even after a couple of days there, the steepness of the upper flights of stairs surprises me. My friend went to our hotel dining room for coffee and breakfast while I went to reception to learn the train times. I didn’t love the train schedule. We would have had to rush for the next train at a few minutes after 9. A FlixBus ticket is good for the one trip booked; there is no catching the next bus unless you’re able to purchase a new ticket on it. That next train didn’t seem possible to catch and A wanted her morning coffee and some breakfast. We would take the next train which was really pushing things. I quickly downed a croissant and sips of the coffee that A had thoughtfully ordered for me, then went ahead to buy our 4€ one-way train tickets from Riomaggiore to La Spezia. The night before yesterday my TIM (Cell phone/data) service ran out of gigabytes and seemed to have killed the 1000 minutes too. (I actually still had calls, but I didn’t realize that.) Under the impression that my service loss was due to missing sufficient credit to auto-renew, I am now traveling without cellular service. No maps. No looking up info. I’d gotten used to these benefits — oh so different from my pre-tech travel days. I’d thought I was well set up with internet and phone calls and here I am, feeling crippled and frustrated. As I walked to the track, validated track tickets in hand, A saw and met me. We had a few minutes to spare so she watched my bag (I love having a companion to do that!) while I walked a bit to find someone to help with my TIM service. A 20-something-year-old man kindly read my TIM messages and tried calling TIM for me. He (too) couldn’t reach a human. He told me there is a TIM store close to the train station but we couldn’t stop. I’d be making this trip without benefit of internet to communicate or get some work done. Back at the La Spezia train station we had not quite enjoyed our first time through at least now we knew where the bathrooms were. The bus from the La Spezia train station to the bus station would pick us up right in front. We had at least 10 minutes. Just as I ran into our McDonalds (or was it Burger King?) bathroom, A phoned to say she’d spoken to a man at the bus stop and learned we needed to buy our bus tickets in the tabacci shop before boarding. Found it! €1.5 each. Good that I had two €2 coins handy. A few minutes later, the bus picked us up in La Spezia. A’s helpful man spoke to the driver for us and confirmed the info I had about where to get off for the FlixBus. He learned, then told us that they will change drivers and to tell the next driver and he wrote the name of the hotel that was our stop. The man departed. A woman came on, saw my little red notebook (a gift) and offered help in great English although she was Italian. When the bus drivers changed she spoke to the new driver for us. We thanked her, of course. The new driver told us our stop. As it turns out, it was clearly marked — but that is definitely not always the case! We didn’t see the bus station to our right as the woman thought we would. I asked a woman coming out of a building, “FlixBus?” She pointed across the wide street and, in Italian-English, said to walk under, pointing to the steps. Funny, we’d looked forward and right but not behind us. We went down, under and up arriving in a large parking lot with 2 rows of buses. I walked toward a green one but saw that it was not FlixBus. I asked. “Flixbus comes on the street there,” he said in a German English as he gestured toward the street we had just walked from. We walked over. Another man was also standing there. Now I knew why a someone had been sitting on the wall at the stairs we came up. I received a text. (I gave my phone number when I reserved.) Yes, I was a bit surprised that the text service worked. Dear passenger, your FlixBus 505 to Venedig is white today and will be operated by the company Flybus. I needed to use a bathroom — again! — and wasn’t sure there would be one on the bus. (Would there be Wi-Fi I also wondered as this was no longer their actual bus.) I had a pretty long walk across the large parking lot and upstairs to the stores. I was told “no” in the electronics superstore. Next store was closed. Burger King was closed. Returning to the “no” and I walked past her making a face, then was told “over there” by a much nicer woman. Back to the bus stop. Waited a while. 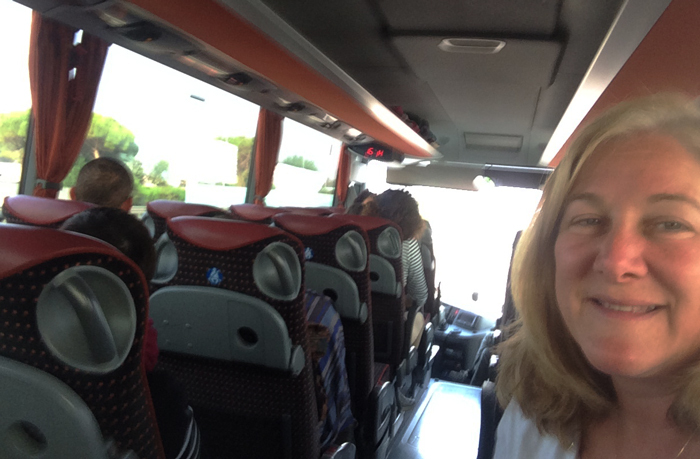 On the bus to Venice, Italy! Tickets verified, our luggage was placed under the bus and as we boarded, I asked the driver for the Wi-Fi code. We were in luck. We had Wi-Fi. I checked my email. I may be traveling freely in the world, but I always have my obligations. Some work discussion. Some press information I forwarded to the right person at Computer Talk Radio. Then this email batch brought great, but not unexpected, news. I was welcome for a visit to my fabulous friends in Ljubljana. 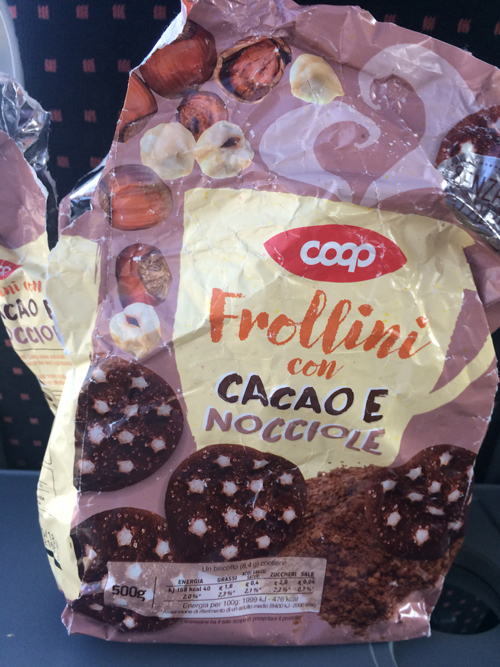 Really nice bagged cookies – my lunch. At 12:35 or so the bus stopped in Parma. Two people got off so I moved to their seat giving my friend a double seat to herself. At 12:55 we pulled into a stop between Parma and Modena. The next big stop is Bologna. 1:46. We just exited a toll road freeway as we near Bologna. A woman is getting her stuff off the shelf. I am ready to move up to my favorite front seat. Several women got off. My plan was foiled. The 2nd driver moved into that seat, claiming both front rows. I am now in the 2nd row and can clearly see the road by sitting in the inside seat. When I packed this morning I put my sewing kit into my in-bus bag so I could sew the inside of my skirt pocket. I finally made that pocket fully usable. The pocket is so long and deep that I could reach and sew it without indecent exposure. When I first made the skirt I didn’t sew a second — inside — seam for the pocket. Only the zigzag to keep it together and from fraying. So now it has an inside seam as well. It is 2:48. I want to sleep. I didn’t even try to sleep. As I still have no cell service I took photos of my Mac’s screen to provide us with the google map info. Google maps recommended a water bus route. How cool. I looked up the water bus prices. Only €1.50 and we could take it almost all the way to the hostel.I was jazzed! When we’d bought our FlixBus tickets we didn’t know which of the two Venice stops we really wanted so we bought tickets for the second stop. However, we’d put our luggage is in the hold for the first one and now that I looked at the map, I saw we really wanted that second stop. Happily, it turned out not to be a problem as the hold was fairly empty by the time we got off. A young couple on the bus heard me ask another woman about where the bus station is and she told me. They are very helpful and are going to the same stop that we need, so now we have a guide. Things like that often have a way of working out when you’re traveling. 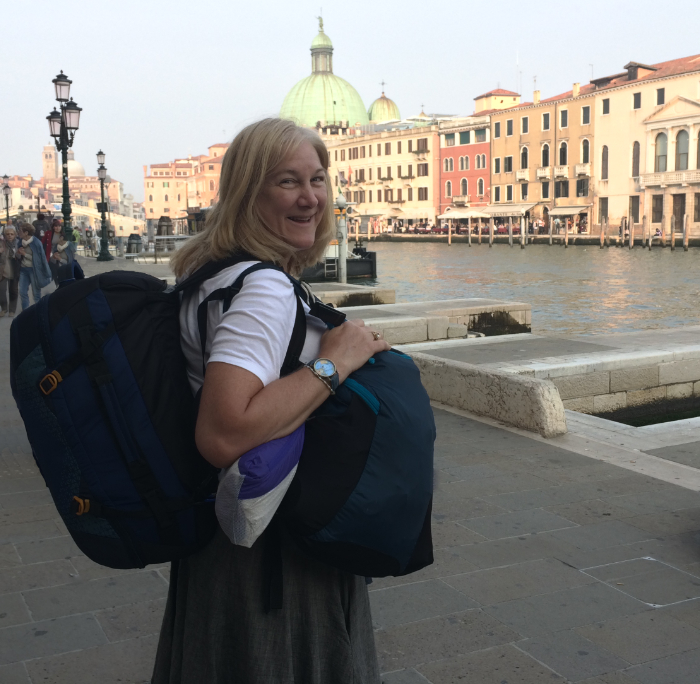 Arrival – in Venice, Italy! This is me with all of my luggage. The couple was so great! They and their friend walked us all the way to the hostel! Yes. We walked over a bridge rather than use the “people mover ” because they just prefer to walk. Then they walked us to the boat stop and showed us where we were and that we would go two stops. 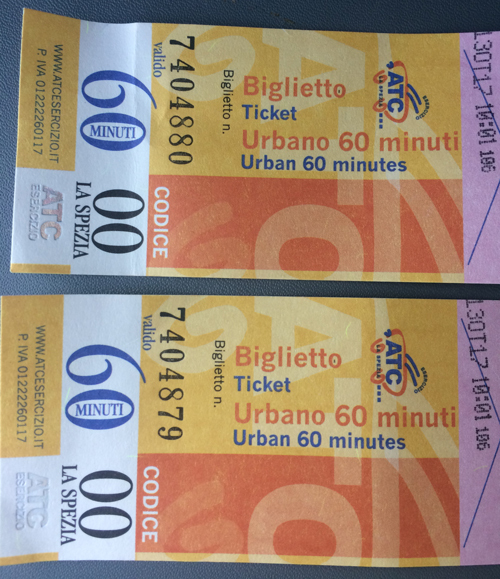 As I’d asked, they were going to help us buy a book of tickets — until their friend told me that one ride is €7.50. 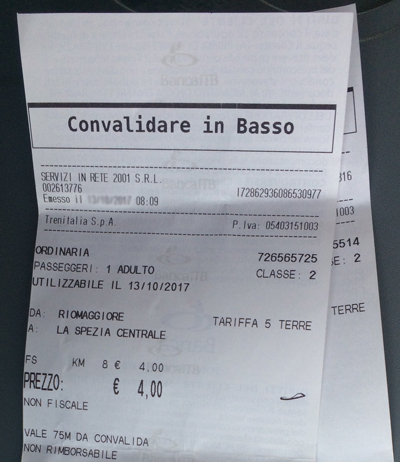 The €1.50 that I had read is the locals’ price, and the website (which I’d translated from Italian using Chrome browser) didn’t publish a tourist price. A’s map said our hostel was .7k miles, so she was ok with walking and I’m always up for the walk. We had our escorts and they said they liked the challenge of finding some small place on some small “road” they’d never heard of before. So onward we walked. A was traveling with a wheeled bag at this point. As you see, I am carrying an EagleCreek Hauler carry-on with basic backpack straps as well as my ChicoBag daypack. 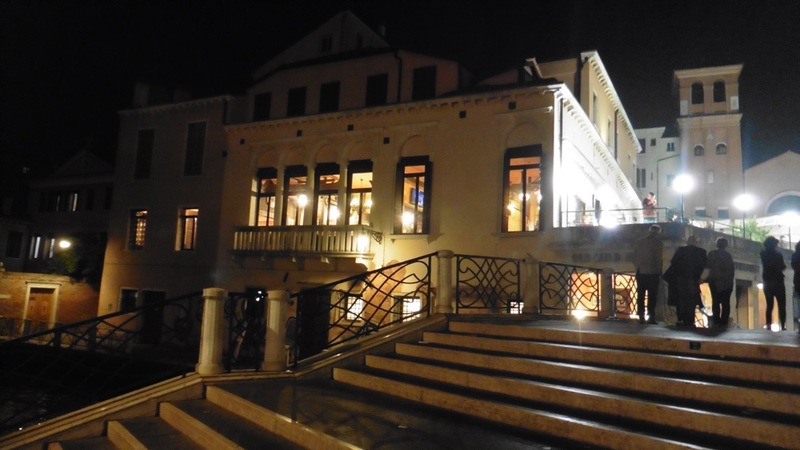 Venice is a city full of small highly-arched so Annaline had to carry her bag up and down quite a few sets of stairs. This is an example of when a backpack is much nicer than wheelie luggage. She’s a trooper though. As we walked, I asked one of the guys to take a photo of me. So here I am carrying all of my stuff. The purple thing is my jacket and doesn’t typically hang out clipped like that. In front of Casa Fiori as we head out for the evening. Off the main “road” onto a tiny street alongside a narrow waterway that has hopefully smelled better at times, we found our destination — a tall wooden door into Casa Fiori. We were “home” for the night. We were in Venice, Italy!! 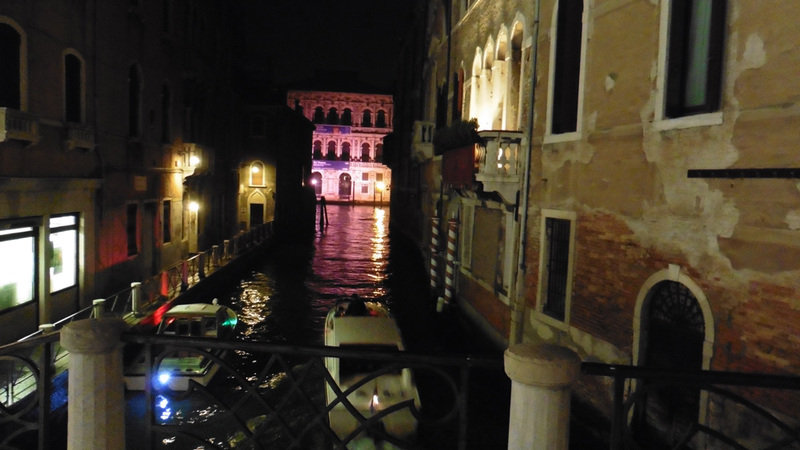 What would you do on your first evening in Venice, Italy? A scroll? A nice dinner? Watch to boats navigate this unique system of waterways? My first stroll was a fast-paced walk to the TIM store to get my phone and cellular data back. At 6:56 I was in my 2nd Venice TIM store behind 5 others who all need a lot of help. In three more days, I would leave Italy and perhaps it would be cheaper to get a plan in Ljubljana, my next visit. This felt stupid. I’d also lost my friend in the crowd of the main street so I’d rushed on before the stores would close. As TIM gave me Wi-Fi, I caught her message. She’d thought I was going to another TIM store, turned around and I was gone. Soon enough, the staff clarified things for me but bottom line is that services reset at midnight on the 29th day, so paying earlier would not have helped. I just had to wait. Not a good cell plan. I won’t necessarily be recommending TIM.